Louise Bunn and I will have a shared art exhibition in January at the Unitarian Church of Vancouver. I’m eagerly awaiting The First Signs by Genevieve von Petzinger about the 32 geometric signs found in caves that go back before the beautiful paintings by mammals. The Creative Neighbours Salon on October 23 will feature Louise talking about “Poetic Landscapes” and I of course will be there as well as one of the hosts for the series. RSVP is very much appreciated so we can plan as space is limited. I made my first skeleton several years ago, just after we put PETE the Polyethylene Bird to rest 9RIP, PETE). 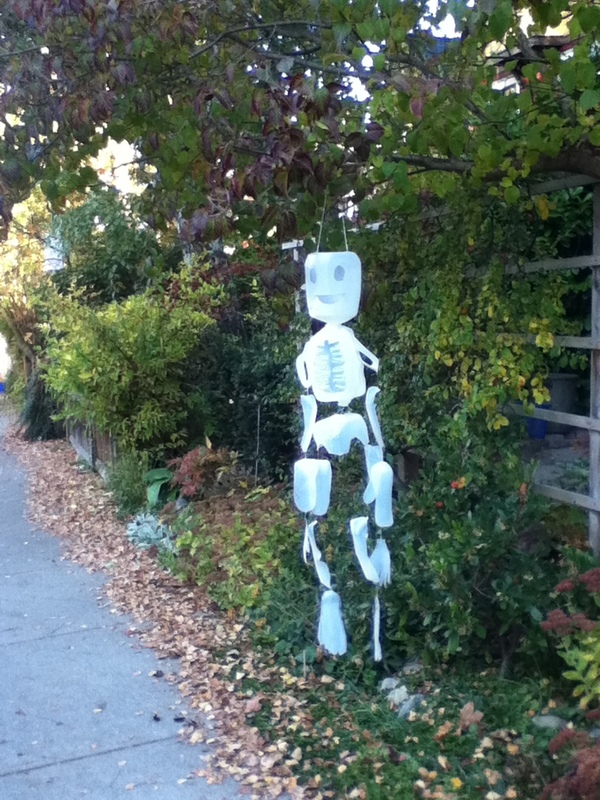 The second milk jug skeleton will be easier, but this guy has gotten thumbs up from my neighbours. When the wind blows, he’s particularly charming, I think. Hoping my neighbours are giving out treats for Hallowe’en as I’ll be at the Cemetery for All Soul’s and I do think it’s a little misleading to decorate and then not be home to answer the call of “Trick or Treat”. Hmmn. Maybe I could put a pillow case out by the skeleton to invite donations of treats! Now I invite you, your friends (and your milk jugs) to a workshop to learn how to make your own. Register here for the Tuesday, October 25, FREE workshop at Kits House. You need 7 milk jugs to make a whole skeleton, but if you have only one, you can make a skull. Come along and help others and learn how to do. Tip: If you have a favorite coffee shop, they might put aside their milk jugs for the day and you’d have enough just like that! And then, bring your skeleton along to out Post-Hallowe’en/Samhain Circle Dance at the Unitarian Church, 49th & Oak, on Tuesday, November 1st. At this time of year, the veil between the worlds is thin and we honour our ancestors. We’ll have a table for an ancestors’ shrine, if you’d like to bring a photo or object of remembrance.